Primary Natural Resources forests, peat deposits, oil. 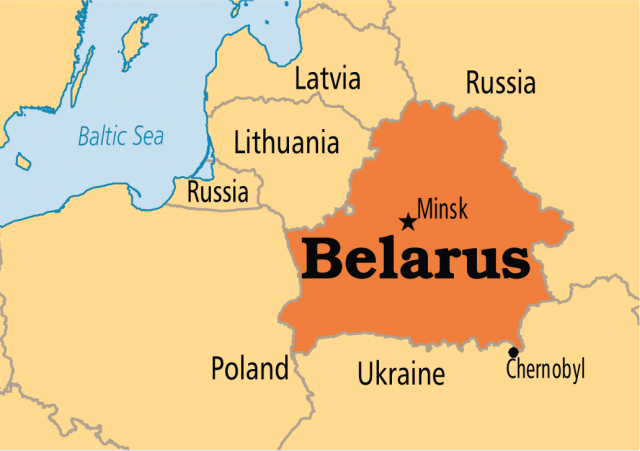 BELARUS, FORMALLY BELORUSSIA, also called White Russia, is bounded on the west by POLAND, on the northwest by LATVIA and LITHUANIA, on the north and east by RUSSIA, and on the south by UKRAINE. Ethnic Belarusians, who speak an East Slavic language closely related to Russian and Ukrainian, make up more than three-quarters of the population. Ethnic Russians are the largest minority group, followed distantly by Ukrainians and Poles. Much of Belarus consists of flat lowlands separated by low hills and uplands. The highest point, Dzyarzhynskaya Hara, is only just over a thousand feet in elevation. Belarusian uplands were created during the last ice age. The limit of the last advance of the ice sheet lay across the country and is marked by a line of terminal moraines, known as the Belarusian ridge (Belaruskaya Grada). This ridge runs west-southwest to east-northeast from the Polish frontier north of Brest toward Smalensk and consists of low, rolling hills. River valleys cut the ridge into a series of uplands, the sequence being: Hrodna upland, Vaukavysk upland, Schara valley, Navahradak upland, Nioman valley, Minsk upland, Biarezina valley, Dzvina and Vitsebsk-Nieviel upland, Dnieper upland and a final group of uplands along the eastern boundary. The highest group is the Minsk upland. North and south of the ridge lie extensive lowlands. To the south lies the biggest Belarusian lowland called Paliessie, which is drained by the Prypiac River and its tributaries. The Prypiac River flows eastward to join the Dnieper River, which crosses the eastern part of Paliessie from north to south. In northern Belarus lie two more large lowlands: the Nioman lowland, drained by the river of that name, in the northwest, and the Polacak lowland, drained by the Western Dzvina, in the north. These two lowlands are separated by two morainic ridges, the Ashmiany and Svientsiany ridges, with the Viliya valley between them. The two northern basins contain many lakes of glacial origin, the largest of which is Lake Narach. Thus, Belarus falls into three main drainage basins, the Dnieper-Prypiac basin draining into the BLACK SEA, and the Nioman and Western Dzvina basins, draining into the Baltic Sea. Forests cover about one-third of the country’s area. The Belovezhskaya Forest, which straddles the Belarusian-Polish border, is home of the rare European bison, or wisent. The Pripet Marshes occupy much of southern Belarus. Belarus’s continental climate is moderated by maritime influences from the ATLANTIC OCEAN and is characterized by cold winters, mild summers, and moderate rainfall. Much of the Belarus land is suited to crop production, especially fodder crops. Belarus is generally poor in mineral resources, but it does have sizable deposits of potassium salts at Soligorsk, south of Minsk, which provide potash fertilizer for export. Belarus has clear evidence of early prehistoric settlement. Between the 6th and 8th centuries, Slavic tribes moved into the region, eventually forming local principalities that came under the sovereignty of Kievan Rus in the mid-9th century. The Mongols overthrew Kiev in 1240, and most of the Belarusian land passed to Lithuania, though Belarus retained substantial autonomy. Poland was united with Lithuania in 1386, and Belarus developed a largely Polish-speaking class of landowners. By the three divisions of Poland in the late-18th century, Russia acquired all of what became known under its rule as Belorussia. From 1918 to 1921, Belorussia was fought over by the Germans, the Bolshevik government of Russia, and a reconstituted Poland, with the result that western Belorussia was yielded by the Bolsheviks to Poland. In the meantime, the Bolsheviks had in 1919 proclaimed a Belorussian Soviet Socialist Republic and in 1922 made it a part of Soviet Union. Finally, with the breakup of Soviet Union, the Belorussian republic gained independence in July 1990, and changed its name to Belarus.